Video: Why a clapperboard should be part of your kit bag . . .
Did you ever watch an old Hollywood movie about making a movie? At the beginning of each scene and take, someone holds up a slate with something like, “Scene 6, Take 164,” on it and audibly says the same thing that is on the slate. At the top of the slate is the “Clapper,” and usually after the director yells “Action,” the person holding the slate claps it to denote the start of the scene. Actually, the cameras are already rolling so they can record the slate, and the clap. In the early days of movies, the slate was used to denote the scenes and takes so, when editing the film, the editor was able to piece together the scenes to make the story flow. Scene 6 and Scene 3 may have been in one city, and other scenes in another. As sound came in, the clapper was added to allow synchronization of sound to film. Since the cameras were noisy beasts, the sound was recorded on a separate device, and the clapping sound was synchronized to the visual of the clapper sticks hitting one another. They were then paired up, and the clapperboard visuals and sound were edited out in the final version. Today you may ask why you would want to purchase and use this contraption since the audio and video are synchronized by the camera and in lockstep, unless intentionally unlinked in the video editing software. The answer is that the slate is still needed for real video editing, and the clapper is very handy for synching multiple cameras and the sound with different angles of the same scene. Almost everybody is bothered when the mouth movement doesn’t synch with the sound. The truth is that anyone today can shoot a video! All you need is $100 or more and a heartbeat. Simple, cheap video cameras (or camcorders) are readily available. But, professional video cameras can cost well above $60,000. Why would anyone spend a lot of money for a camera when the images on our TVs looks pretty good from low-priced cameras? A couple of reasons are that the image degrades from the cheaper cameras when less than ideal lighting is encountered. Video noise becomes a factor. Also, sound input and output is better the more you spend on the camera. Should you shoot your own video for your business? Unless you are a budding amateur Spielberg, probably not! While pushing the record button is easy, buying quality software like Adobe Premiere Pro and After Effects is expensive and learning how to use it can be daunting. Using lighting can add quality to your video, and there is a whole science to it. Do you have lights? Do you have pro software to edit your video? Are you proficient in video editing? Do you have a camcorder of sufficient quality to overcome video and audio noise? These are questions you should ask yourself before trying to promote your business in a video. In making a video, my partner and I meet with our client to map out the story before even going near a camera. Videos take planning. Several days of shooting stills and video can go into a short promotional video. Way more time is spent editing it. Now, back to the clapperboard. 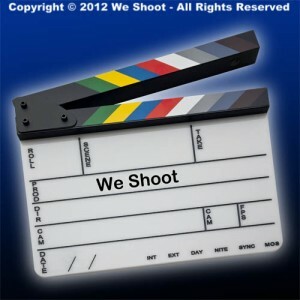 The clapperboard we employ (see image above) allows for a tremendous time savings when we’re editing video. Below, take a look at one of the latest videos we did for a music composer. You will notice that even though we recorded him from two different angles with two cameras, his mouth is in synch in the side view and the front view. The guitar-playing scene was also shot with two cameras. This two-camera setup is included at no extra charge. It adds a dynamic not found in most amateur endeavors, and this professional look much more successfully illustrates the professionalism of your business. Don’t put out a substandard video. It could do more harm than good. Posted in How To, Learning, Tips | Comments Off on Video: Why a clapperboard should be part of your kit bag . . .